Coming from a large, traditional Italian family, Katie spent a lot of her childhood helping her mom in the kitchen where she discovered her passion for cooking and baking. Katie is a graduate of the Culinary Institute of America, with her Bachelors in Business Management. While attending school, she was involved in teaching and assisting in the Continuing Education classes and helped out in the wounded warrior program. She also spent her time freelancing in the private chef and catering world in the Hudson Valley. A New York native, Katie has spent her time split between Southwest Florida and Manhattan. 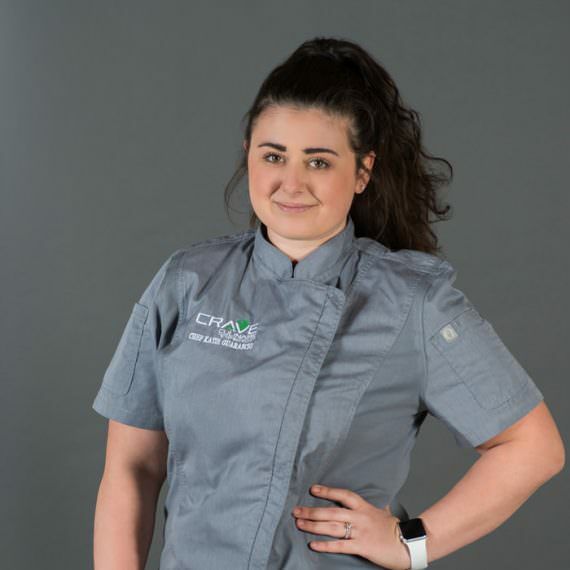 After graduating, Katie started her professional career working at Lupa Osteria, a Mario Batalli owned restaurant where she was able to learn about making charcuterie and roman cuisine. She moved on to really hone and advance her skills in the East Village in Manhattan at a Hawaiian restaurant called Noreetuh, where she worked under owner and Executive Chef Chung Chow. Prior to starting at Crave, Katie worked at one of the busiest restaurants on Fifth Avenue in Naples, where she learned about high volume cooking. Katie was lucky to meet her husband at the CIA, and share her passion for food with him. She spends her free time exploring new places, and enjoying the outdoors with her two rescue dogs.